After a recent trip to Indonesia, I had a jumble of thoughts whirling around in my head. Thoughts that needed to come out in one way or another. During the last few months, I have changed my method of sharing photographs on Instagram by doing some serious self-reflection. Instead of haplessly posting a photo with a stale quote and some hashtags (my previous method), I take the extra time to think introspectively about what the image means to me and how I can extrapolate a philosophical or meaningful message from it. I have already experimented with turning these Instagram posts into blog format with last month's Finding the Story. This post is a similar style, but with some different topics and a bit more focused, as all of them are from my Indonesia trip. I have put the photos and captions in chronological order in an attempt to create some cohesion. Enjoy! Throwin' it back to my last trip since coming over here to Korea. I captured this photo of an awesome new friend that I met on my solo trip to California back in January. In three days, I'll be heading to Bali for my summer vacation from teaching English. Looking at this image from a previous trip brings back some unforgettable memories, feelings and emotions. I'm also recalling how I felt on the days leading up to departure time. Right now, I have that same nervous excitement churning through my body. I'd have to say it stems from the uncertainty, unknown circumstances, people and places that I will inevitably come across during my travels. It's difficult to describe it, but I know I live for that feeling. It's always important to look upon our past adventures with a healthy sense of pride and gratefulness as we look forward towards new landscapes and horizons. View from our first flight of the trip to Indonesia that began two weeks ago. This crazy day involved taking buses, trains, multiple planes, taxis and sleeping in airports before finally reaching our destination in Bali after over thirty hours of travel. The start of a journey always has a special magic to it. Although it requires a great deal of patience to endure the endless travel time, unexpected delays and unforeseen issues that inevitably arise, it holds an array of possibilities. There’s no way to predict what may happen or what you will encounter during your time in this foreign land. Each trip can be taken as a lesson in life and growth, but the challenges and moments of fear, joy or exhaustion have yet to be determined. The only option is to take everything in stride and become familiar with these new surroundings. Adaptation is an integral characteristic that we all must possess throughout our journey through life. Change. Grow. ADAPT. 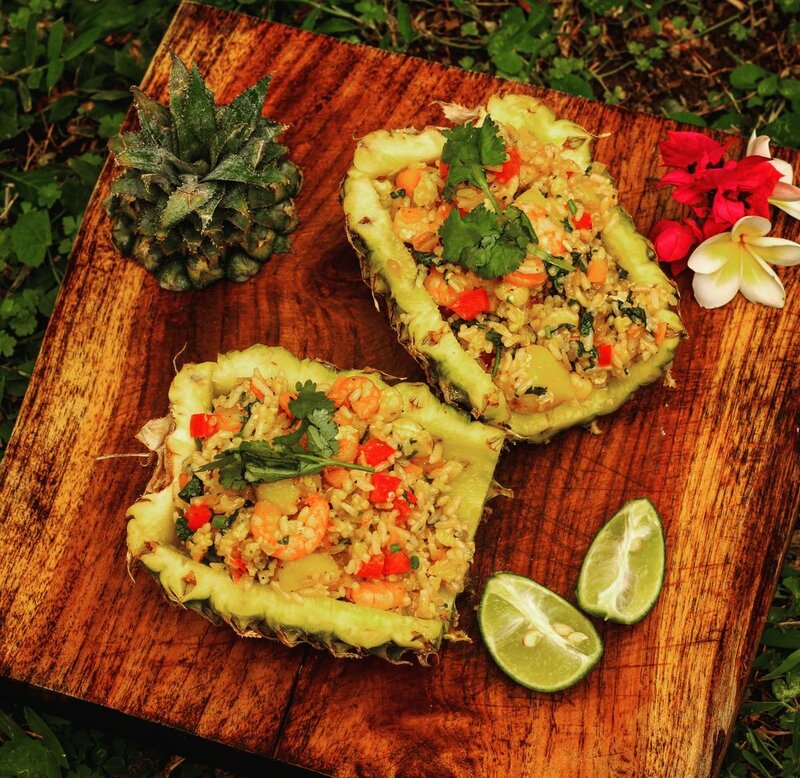 Featuring pineapple shrimp fried rice made in Ubud, Indonesia—a quaint town on the island of Bali. I was fortunate enough to help out in the filming of a cooking video with a talented woman, who I previously worked for in Korea. Coincidentally, she was traveling in Bali at the same exact time as me, and she asked if I would be willing to set aside one day of my vacation to assist her in creating her exotic foods video series. Of course, I had to jump at this opportunity to gain more experience and to eat loads of delicious food like this amazing dish! Filming videos as I travel has been a dream of mine for the past three years, and I’ve dedicated countless hours sharpening my skills and trying to create opportunities. Now, it finally feels like it’s paying off, and it’s an incredible feeling to see the fruits of my labor. During a short break from filming, I took a moment in the tropical paradise that is Bali to reflect on my progress— I realized that I’m steering my life in the direction that I chose for myself. Although the road may be a winding and uncertain one, we can appreciate the beauty in the struggle to maintain on the path towards our hopes and ambitions. At times, it may feel like we’ve lost our sense of direction on this road we call life, but then again, where’s the fun in always being in control? Took a shot of this little Indonesian girl at a rice terrace in Bali. She was holding a basket of postcards, trying to sell them to me just before I snapped this photograph. This girl was certainly not the only young child doing this that I came across during my time in Indonesia— there were countless others selling bracelets and many other items. It’s strange and unsettling seeing young children selling merchandise. It’s even more disconcerting when you hear the lines that these seven-year-olds have memorized. You quickly become aware that someone is teaching them how to effectively sell to foreigners. It’s not always sunshine and rainbows when traveling, especially in less-developed nations. It’s a reality check seeing poverty and injustice up close and personal. It often leads to thinking deeply about how much different your life is from some of the people that you come across. It’s truly humbling to be in the midst of lives that contrast so starkly with our own. Being exposed to these situations changes us forever, and just maybe from these experiences, we'll become more compassionate and open-minded individuals. Snapped this on the bus during my travels in Bali. As my friend zoned out, I took a handful of shots, attempting to capture the sunlight coming through the window and reflecting on his face at the correct moment. During the span of our two-week trip, we took every means of transportation imaginable to get to our destination. As you can see in this photo, all this travel time gives you an opportunity to rest a bit, but it also can be a time to reflect on your current adventure or on other aspects of your life. I try to think of this as a therapeutic exercise. Instead of looking at this as dead time, we can use all these hours to reset our minds as we prepare to adapt to a new place or environment. Sometimes we get too consumed with our lives, and we just need to take a moment to breathe as we prepare for whatever happens to come next. We awoke at 2 am, and we were greeted with chilly air and an amazing panoramic view of the stars, brilliantly shining and dancing across the early-morning sky. As I tried to wake up my aching body and groggy mind, I tried my hand at a few long-exposure photographs of the star-filled sky...to no avail—the photo just didn't do it justice. It was at that moment, minutes before setting off on the most strenuous and mentally draining hike of my life, when I was reminded that experiencing something beautifully raw and majestic in real life will always outshadow the digital version. During our current age of information overload—to the point of digital delirium—it can be easy to forget about being present in our real lives. We can try to recreate our thoughts/feelings online, and there's no denying the benefits of the incredible technology available to us every day, but let's not forget that those authentic, introspective moments in the non-virtual world hold more weight than we can even begin to measure with a computer or a smartphone. A couple of GoPro photos from the top of Mount Rinjani (3,736 meters/12,224 feet) in Lombok, Indonesia. I wanted to snap some more on my DSLR, but the cold and wind at the top of this massive mountain made that quite difficult. This was hands-down the most challenging hike I’ve done in my life thus far. Shortly after the ascent began at 2 am, my hands and face were aching in the 2 degrees Celsius (35 degrees Fahrenheit) air that greeted us on this extremely steep incline. There were narrow areas along the way where, if you stumbled off the edge, you would probably never be heard from again. Additionally, the pitches that we were climbing on were nothing but small rocks and dirt, illuminated only by the headlamps strapped to our heads. This terrain resulted in an extremely loose hiking surface. Essentially, you would go two steps forward and slide back one full step. To make matters worse, the biting wind was howling, launching dirt and debris into my eyes the entire way up. There were several moments where I collapsed in exhaustion, resorting to playing mental games with myself to push on for the peak. I think everyone who climbed that dark morning will agree that it was an excruciating three hours. Although it was agonizing, we had made it to the top! As always, the sense of accomplishment and beauty were well worth the climb. We had conquered this beast of a mountain, and we lived to tell the tale. The struggle is just part of the process. In hiking and in life, sometimes the only way to get where you want to be is to move forward with each step, even if you slide backwards.